CastleMiner Z is a sequel to the popular Xbox Live Indie Game of CastleMiner. While CastleMiner was a creatively focused experience the sequel pushes the game into survival orientated gameplay. 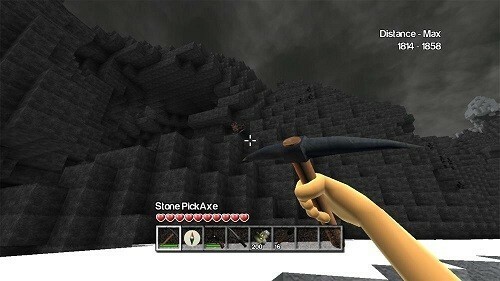 In CastleMiner Z you will explore a vast block based game world and attempt to protect yourself from zombies with weapons created from resources that you have collected. These weapons are mostly made up of various gun types giving the game an FPS feel while still retaining the sandbox elements of other games in the genre. Just like the original game, CastleMiner Z has proven very successful mostly due to its low price (only $1) and the ability to easily jump into a game with multiple friends. A nice little feature is the ability to use your own Xbox avatar, giving you a sense of belonging in the game. In CastleMiner Z you will start out with no resources and have to collect everything from the world around you. You can cut a tree down for wood or venture into the many caves in order to mine for rarer materials. 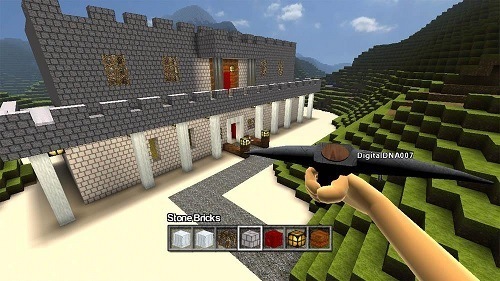 You’ll then use these materials to build structures, create torches, build tools to enhance your resource gathering abilities or craft a variety of guns to fight off zombies, demos and even dragons that you will have to face. Of course you could just as easily build an impenetrable fortress and hide up inside it without fear of zombie attacks but where is the fun in that? To help you explore the game world, CastleMiner Z encourages you to push forward by counting your distance travelled to see just how far you can push your survival skills. While the game is randomly generated it seems to be setup in such a way that the further you adventure the harsher the environments become adding to the difficulty. For only $1 and the ability to play with friends, CastleMiner Z is really a no brainer decision for fans of survival, FPS or sandbox games. Similar to the original with enemies and guns. Great variety of guns with different stats to craft. Try to achieve as much distanced travelled as possible. Multiplayer options double the fun. I disagree about the bad part. I read the wiki about the mobs and I think the dragons are enough because of the strength of the undead dragon. If all the dragons were hurling at me I would run! And does minecraft have and end goal? No! The enderdragon is not the end of the game. You just keep playing and playing.